For example, OnHub’s built-in network monitor shows you all devices on your WiFi network and how much bandwidth each device is using – in real time, on your Android-powered mobile device! The OnHub app provides tap-button control over bandwidth prioritization. That means Junior’s gaming won’t make Mom and Dad’s Netflix movie all jittery, or vice versa if it’s the kids’ turn to hog the Internet. OnHub has 13 internal antennas (that is not a typo) configured in concentric rings, to deliver maximum signal coverage consistently over wider areas. During setup, for which the Android app is required, OnHub automatically scans all available channels and selects the best overall signal on either 2.5 GHz or 5.0 GHz radio frequency bands. Supported protocols include 802.11 a/b/g/n on 2.5 bands; 802.11 a/n/ac on 5.0 GHz; an auxiliary 802.11 a/b/g/n/ac radio. There’s a 10/100/1000 Mbps Ethernet port and switch. WiFi connections are secured with WPA2-PSK encryption. Another cool feature of the OnHub app is easy password-sharing. If you want to let someone share your WiFi, just tap on his/her device displayed in the app and the device gets your network’s password until you revoke that privilege. There’s no need for the guest to know your password, and no need to change every “resident” device’s password after the guest leaves. Configuring and managing a WiFi network via a wireless Android app is inherently less secure than the traditional requirement for a hardwire Ethernet connection to the administrator’s console built into a router. But Apple’s Airport Express routers have used an iOS app in the same way without major problems. Speaking of Airport Express, its $200 price tag is identical to OnHub’s. The Airport is also tall to accommodate multiple antennas; but with its flat sides and rounded corners it looks like a piece of Tupperware for keeping saltine crackers fresh. The OnHub is definitely more stylish. Instead of tiny blinking lights, OnHub displays its status with six tri-color LED arrays arranged in rings around the chassis. Your router’s status is clearly viewable from any angle. An ambient light sensor keeps the LEDs from shining too brightly or being washed out in sunlight. You can also view the status of the OnHub, and manage the connected devices via an app for your mobile phone. OnHub won’t become obsolete in 3-5 years, as many older routers have. In fact, it already has future protocols built into it, including proposed home-automation protocols Bluetooth Smart, Google Brillo/Weave, and IEEE 802.15.4. OnHub has 4 GB of internal flash memory, ample room for future upgrades and new features. Of course, OnHub automatically receives software updates from Google, just as the Chrome browser does. You don’t have to worry about doing manual firmware updates. There’s a bit of mystery surrounding two details of OnHub. Google isn’t saying what the USB port is for, or what you might hear from the 3-watt speaker mounted atop the OnHub. My guess is that OnHub’s resemblance to Amazon’s Echo is no accident; you’re going to talk to OnHub and it will talk back, someday soon. One thing I've worried about when considering a replacement for my router is whether it will work with my Verizon FIOS service. But the OnHub website promises that "It works with cable, DSL, Fiber, and all major Internet service providers." 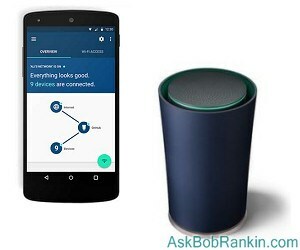 Most recent comments on "Google OnHub: The Ultimate WiFi Router?" Bob I have Comcast Xfinity triple play - cable, wi-fi and telephone. Is there a router/modem combination that would replace the Comcast router/modem that I have to rent from Comcast? It would be nice to be able to save the monthly Comcast rental fee. Will we be able to individualize the services? E.g., will I be able to change the DNS service, use OpenDNS, etc? Will I be able to lock out by MAC address? Sounds intriguing! Can mount I it upside down on the ceiling in my hallway? I'd get an excellent signal all over the house that way. EDITOR'S NOTE: I imagine so, but how would you plug it in? Too expensive, in my opinion. My $80 NetGear dual band router is performing just great in our home....on the 5 gHz band. With the Hub....what does one do if he doesn't have any Android devices to set it up and control it? I don't think this one is for us. Any ball park figure on cost? EDITOR'S NOTE: $200, as mentioned in the article. The HUB site says that if you have Verizon FIOS that the HUB will be an add-on to your router. So you can't replace your Verizon FIOS modem/router with the HUB. $399.98 + shiping is the lowest price on amazon. No sign of it anywhere in the UK. It's a lot of money even if only $200. This sort of stuff is £ for $ at a 1:1 here (Tax, VAT Duty and profiteering) and even a bells and whistles twin doodahs with a few ariels is only half that price. Looks like another way for Google to track all of our activity. I wonder how Google OnHub will deal with modified DNS or VPNs? Thanks Bob, but I think I will wait until the price for the onHub drops below $100.00. I will give it a year. I have Dish for my internet. Will the Hub work for me? I would love a future article on how this compares to the Apple Airport Express router! As others have pointed out, there is nothing about MAC address filtering (I know it is easy to spoof, but at least prevent drive by access), nothing about a firewall nor NAT. All this is available in a number of routers including Apple's Airport Extreme (which I think is more stylish than a tube and doesn't have blinky lights, it requires an app and has been like that for years). You'll also need a switch if you want to connect more than one wired connection. Most WiFi routers have more than just one Gigabit LAN connection. You still need a WAN cable to your modem, and if you have a modem/router with WiFi, you'll need to disable that one if you get the OnHub. For @Tom17004, I would recommend the Netgear modem, CM500-100NAS which is certified for Comcast Xfinity/TWC/Cox/Charter. I have that one for TWC (it's $100 but will pay for itself by not renting from TWC in about a year) and with the Apple Airport Extreme (which I feel is more stylish than the OnHub tube). I get to my Mac Air, at 305Mbs down, 22Mbs up over WiFi (802.11ac - I'm not talking about direct to the router connection). Likely OnHub will post similar numbers. The specs of the OnHub don't mention the USB port. That port for most routers allow connection of printer or disk. I have been cruising nicely with my current setup for years. And since it ain't broke, I am not going to fix it. My Linksys E3200 router has a USB port for storage devices. I use a portable hard drive attached to the router, and it immediately becomes available to all on the network. This is great for backups and file sharing, and I would not buy another router without this feature. I refuse to go android for security & privacy reasons. A possibly smart and very expensive router will not change my mind. What I want is dynamic blocklist facilities by both URL names and absolute addresses. What chance is there that Google will let me block their extensive privacy intrusions via their own router? You say: "My guess is that OnHub’s resemblance to Amazon’s Echo is no accident; you’re going to talk to OnHub and it will talk back, someday soon." I'm not paranoid, but it sounds like Google will be able to listen in on conversations, not to mention what everyone is doing on their devises via the router. It's a new world for us Baby Boomers! Thanks for all your great information, Bob! Being that it's a Google product, I would first ask what data collection it does behind the scenes, and how it does it. Many nice features, yes, but some things are missing or not listed--LAN ports, firewall. Using Android to access the router seem like a bad security idea to me. Price of $199.99 is attractive, but I think the new Netgear Nighthawk tri-band router ($276 at Amazon) is a more secure and safer option.